The Northeast Creek Streamwatch Puppet and Parade unit participated in the organization of the Durham Monarch Festival 2015 along with conservation organizations from throughout Durham County. 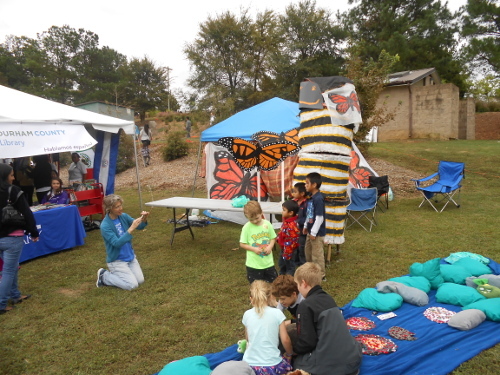 As part of the festival, schools were encouraged to participate, and Northeast Creek Streamwatch member Nancy Lambert turned her art class at Fayetteville Street Elementary School into creating art representing the life cycle of the monarch butterfly. The big burlap sculpture that the class made of a monarch caterpillar was a big hit. Northeast Creek Streamwatch member Colleen Haithcock painted the large monarch butterfly banners and some of the signs used for festival operations. The grand parade for releasing the monarchs was led by a stylized milkweed floral spray that Colleen made. Monarchs migrate from Canada and the United States to the Michoacan area of Mexico every fall and return north every spring. Each journey represents about three generations of monarchs, which lay their eggs on milkweed plants. Because milkweed plants are toxic to livestock, the habitat for monarchs has been decreased from increased pasture land use and from urban development. Conservationists are encouraging the planting of milkweed as butterfly gardens to increase the monarch population. The familiar yellow, black, and white striped caterpillar is the larva of the monarch; get used to tolerating seeing these on the milkweed that you plant for them.